Amongst the chunky grey soil and sun-bleached rocks, a burst of colour appears under the scorching Mexican sun; a sea of pink shocks the eye into focus. At least a dozen names are written in cursive; Brenda, Esmeralda, Veronica… also written is the word Desconocida – Spanish for Unknown. 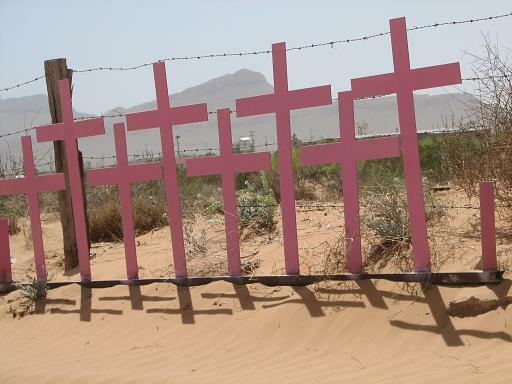 The names (and tragic substitutions) adorn a memorial of pink crosses erected in memory of people who have been murdered, often horrifically, because of their gender. They are all women. They are all victims of femicide. The word femicide has been widely contested since its post 1960s revival. A relatively clear definition can be attributed to feminist activist and writer Diana Russel who stated, ‘Femicide is the killing of females by males because they are female’. Human history is littered with examples; women threatened with death for leaving their homes while menstruating, women (as opposed to men in the same circumstances) who were forced to commit suicide as not to dishonour their family or religion. In 2011 an American Republican, Bobby Franklin, proposed a law that would have women face the death penalty if they could not prove their miscarriage had no human involvement. Femicides (also known as feminicides) have, in one form or another, been around for countless years. Human reasoning may have altered but, tragically, gender-based violence is still a reality in various parts of the world. The notion of a femicide regained attention in the mid 1990s when a wave of murders took place in the north Mexican city of Ciudad Juárez. To this day Ciudad Juárez is synonymous as the gruesome hub of drug related crime and a growing list of unsolved femicides and missing women cases. The pattern of misogynistic murder began when, in the late 1980s, American companies established production factories, or maquiladoras, in Ciudad Juárez due to its proximity to the United States and the virtually non-existent Mexican labour costs. As more cost cutting businesses set up shop in Mexico, scores of job seekers (predominately women) migrated to Ciudad Juárez –now a bustling city, swollen with new arrivals and drug traffic – in search of work. The maquiladoras typically hired young women who had set off alone in search of greater opportunities beyond the many impoverished rural settlements. Those who were fortunate enough to become employed worked long, poorly paid hours. It was a disastrous culmination of events. The surge in international investment created many jobs. As the revived Mexican city grew (just meters from the largest illegal drug consuming nation) so too did its number of drug related gangs or cartels. A large proportion of new residents were lone young women who work exhausting shifts at all hours of the night, who had no one to notice when they didn’t arrive home and who became, all too easily, the victims of misogynistic crime. Over the past 15 years estimations of the number of femicide victims have extended into the thousands. It’s a scale difficult to comprehend. On hundreds of reported occasions (unofficially thousands) young women – the Brendas, Esmeraldas and Veronicas – were systematically raped, tortured and eventually murdered (the phenomenon has been labelled a blood sport). Victims’ bodies are often maimed after death, which makes identification near impossible. It is especially hard when mummified corpses (or random limbs) are discovered in the sweltering heat of the Mexican desert. DNA tests prove useless when there are no family members to use as a comparison. Of the hundreds of these murdered and missing women cases, just a few dozen have been solved. Despite the lack of determination by the police force, the murders did not go disregarded by members of the local community. A woman barely twenty years old when the murders began, Susana Chávez Castillo has emerged as an iconic campaigner in the fight to end femicide. Even in candid photos, Susana’s deeply perceptive gaze is captivating. Her almond shaped eyes appear to morph from jet-black to a light hazelnut. Her raven hair, cut at shoulder length, abruptly halts the shiny curls as they begin to form. A gifted poet as well as activist, for more than a decade Susana championed the rights of women and pushed hard for results from what were often sloppy police investigations. As the femicides continued she became more heavily involved in many support groups established by and for families whose loved ones had been murdered or missing. One such group in is Nuestras Hijas de Regreso a Casa or May Our Daughters Return Home. Throughout her years campaigning Susana regularly held poetry readings and is responsible for the unofficial slogan ‘ni una muerta mas’ (not one more death) which is now chanted at rallies, printed on placards and spoken throughout Latin America. In January of 2011 Susana Chávez Castillo was reported missing by her parents. Four days later her body was discovered – a blood trail led police to her severed hand. - The machismo culture in which men denigrate the status of women. Monogamy, though imperative for a female, is a complete non-issue for many males. A woman may spend most of her time single-handedly raising their children and running the house, yet the man remains the authoritative figure within the home. Domestic violence against women is rife and few offenders face any penalties. Of course there are exceptions to these generalisations, but there remain all too common patterns of toxic gender inequality in, particularly in the poorer, Latin American home. - Mexico is hosting a bloody war within its borders. Powerful drug cartels are battling each other for disputed cities and trafficking routes, the police force (weakened by corruption) is fighting within as well as against the cartels and the number of deaths (including civilians) is in the tens of thousands. As a result of this drug war, femicides are not a high priority on the government’s to do list despite the fact that a significant portion of the crimes are linked to the drug cartels. As the cartel wars intensify, they are moving south into Central American countries such as Guatemala and Honduras, and so too are femicides. As a result of these crimes women are forced to stay home where they are safe. As it becomes too dangerous to be out alone, even in groups, women are facing a form of self-imposed incarceration in their homes as it’s their only guarantee of safety; as a result, men are dominating the public sphere. It is difficult to predict the future for the generations of women and girls who are forced to live in this environment as they are incorporated into this destructive cycle. As is the case when fighting the scores of manifestations of violent crime, public awareness is imperative to putting a stop to femicides throughout the world. Thanks to the word of individuals such as Susana Chávez Castillo, awareness of femicides has grown and recently Ciudad Juárez and its brutal history of crime were acknowledged (somewhat distinctively) by one multinational company and the international media. As a whole, the collection itself was not particularly distinctive, a rather dull palette of beiges, pinks and purples, though a few items did stand out. Housed in a sleek round case, one of the mineralised eye shadows has an ivory base that is streaked with colour ranging from specks of brown and black, to streaks and splotches of maroon and a rich red – blood red. As a stand-alone product it may well be a unique addition to one’s makeup collection, but in the context of a Ciudad Juárez theme, the design is beyond distasteful. The name of the eye shadow? Bordertown. Other titles in the MAC/Rodarte collection included: Juárez, Ghost Town and Factory. A unique ‘celebration of beauty’ if ever there was one. MAC eventually cancelled shipment of the collection before its release date and donated projected profits to organisations working with those affected by the Ciudad Juárez crimes. In a morbid way the MAC/Rodarte controversy did serve a purpose because crimes against women were brought to the attention of thousands of people all over the world. Blogs and websites featured posts about the femicides and news stories contained references to organisations working to fight the misogynistic crimes. Perhaps none of the above would have been possible if not for the ill-fated makeup collection. Nonetheless, the femicides of Latin America continue. As of 2011, almost twenty years after the maquiladoras were established, how many females have been horrifyingly tortured and murdered? No one knows. How many victims are missing, forgotten? No one knows. How many girls and women are lying, undiscovered in the Mexican desert? No one may ever know. It is difficult to summarise such prevalent and distressing crimes without sounding like a cheap spin-off of Unsolved Mysteries. One must try not to disengage from anguish and recognise that the females, the victims of past, present and the future are real people; cousins, sisters, daughters, mothers, friends. Standing in the desolate earth is a decrepit memorial, this one a little older than the first. The pink crosses, having fallen victim to the sun’s strength, have lost their brilliant hue. Peeling black paint hangs in strips off one of the dried wooden crosses. Somehow, the paint still forms a legible outline of a word; Desconocida. This article first appeared in Lip Issue 21 – you can buy a copy of the magazine here. We promise it’s packed full of other goodies! The scariest part is knowing that … to feel safe, women are staying at home. That creates a huge vacuum of women in public places, which makes it even more dangerous for those who would’ve been brave enough to venture out. Never ending cycle. Really, where does one begin? This entry was posted in Featured and tagged femicide. Bookmark the permalink.